Unfortunately there's no sign of an entire season of MIYAZAKI Hayao and Studio Ghibli's films in the run-up to the release of The Wind Rises on television, though Picturehouse Cinemas are running one (that in Liverpool has My Neighbour Totoro on 26th April, Porco Rosso on 3rd May, The Princess Mononoke on 10th May, Spirited Away on 17th May, Howl's Moving Castle on 24th May and Ponyo on the Cliff by the Sea on 31st May, all in Japanese with English subtitles) and Film4 are showing just the previous Studio Ghibli feature: From Up on Poppy Hill (Kokuriko-zaka kara, literally "From Coquelicot [French for corn poppy] Hill"), directed by MIYAZAKI Gorō, on Sunday, 4th May at 5:20 PM (poster below; click on it or here for full size). Film4 is Sky channel 315. It was produced in about only one year as a low-risk experiment in trying younger staff in lead positions, so is not really representative of what to expect from The Wind Rises (which was made under the regular, veteran staff and with about five times the time and budget) but is worth seeing in itself. And before seeing it I recommend watching this video of SAKAMOTO Kyū performing "Ue o Muite Arukō" so that you may recognise him in it. Please feel free to forward this on to anyone you know who might be interested or that lives nearer to the Picturehouse. Thank you for the reply; I will. While the Picturehouse at FACT might not be worth travelling to just for a film for you I thought I might as well mention it as your closest and in case you know anyone nearer who might be interested (please feel free to forward on the information). I've also just read that From Up on Poppy Hill on Film4 on Sunday was the American dub, but they will be repeating it with the original audio and subtitles "later in the month". As some background to From Up on Poppy Hill (the original title is Kokuriko-zaka kara, literally "From Coquelicot [French for http://en.wikipedia.org/wiki/Papaver_rhoeas corn poppy] Hill"), it was produced in about only one year as an experiment in trying younger staff in lead positions, so is not really representative of what to expect from The Wind Rises (which was made under the regular, veteran staff and with about five times the time and budget) but is worth seeing in itself. It's based on a 1979–1980 http://comic-twitter.blog.so-net.ne.jp/kokurikozakakara comic, which was selected as source material for this experiment and written for the screen by MIYAZAKI Hayao (who choose to re-set it further back, in 1963) and given to MIYAZAKI Gorō to storyboard and direct. You can see some of his and character designer KONDŌ Katsuya's concept sketches in http://www.parkablogs.com/content/book-review-art-of-poppy-hill this review, a particularly wonderful example of which was used for the original poster (below and full-size http://www.mono-chro.jp/blog/assets_c/2013/01/20130111_ko01-96.html here). Also, before or after seeing it I recommend watching https://www.youtube.com/watch?hd=1&v=55nBLB4zr2U&gl=GB&hl=en-GB this video of SAKAMOTO Kyū performing "Ue o Muite Arukō" (which was topping the charts in America and Britain the exact month Poppy Hill is set) so that you may recognise him in it. Selected by TAKAHATA Isao for the Ghibli Museum Library and released in Japan via them about a month before The Wind Rises. Listed below are some acclaimed and long-awaited animated features, most aimed at a general rather than specifically family audience, which are currently or soon to be playing in British cinemas but which you’re unlikely to see advertising for. The majority are “Key Cities” releases which will most likely only play in _ at the closest (though it’s worth checking in case they turn up anywhere else) but The Wind Rises is getting a “Wide” release and is the only animation drawn on paper, or Japanese cinema or really anything much like it that stands a chance of doing so for the foreseeable future; hence I’m particularly keen on alerting anyone I know to its existence. From Paul GRIMAULT and Les Gémeaux (), based on “https://archive.org/stream/littleellieother00andeiala#page/104/mode/2up The Shepherdess and the Chimney-Sweep” by H. C. ANDERSEN and selected for the http://www.ghibliworld.com/newsarchive.html#1601 Ghibli Museum Library. To find where it is playing I recommend seeing the list of screenings http://www.independentcinemaoffice.org.uk/films/playdates.aspx?ID=7156 here (though it’s been out for a while there are dates until __ this year) and creating an alert to be emailed if a nearer one is announced http://www.filmdates.co.uk/films/7088-the-king-and-the-mockingbir here. Then enquire with the cinema as to whether they are showing it in French with English subtitles or the American English dub. From Ignacio FERRERAS (http://www.channel4.com/programmes/how-to-cope-with-death/4od#3379455 How to Cope with Death, The Illusionist animator, "https://www.youtube.com/watch?hd=1&v=Gxy9Qm-FCgI&gl=GB&hl=en-GB%20 1000 Characters SMSing"), and and selected for the Ghibli Museum Library. I recommend seeing the list of screenings here and creating an alert http://www.filmdates.co.uk/films/3914-wrinkles here. Available in Spanish with English subtitles and American English dub. From YOSHIURA Yasuhiro and STUDIO RIKKA (). 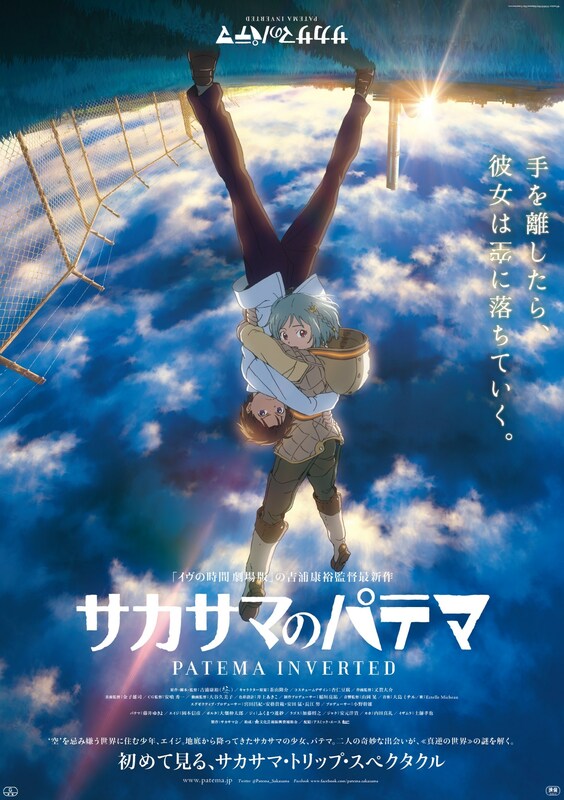 I recommend seeing the list of screenings https://www.ourscreen.com/search/screenings/?Req.SearchTerm=patema+inverted&Req.Time=any here and creating an alert http://www.filmdates.co.uk/films/6475-patema-inverte here. Available in Japanese with English subtitles and American English dub. From MIYAZAKI Hayao and Studio Ghibli (Laputa, Totoro, Sprited Away, Ponyo). I recommend seeing the list of screenings http://www.findanyfilm.com/The-Wind-Rises~59564 here and creating an alert http://www.filmdates.co.uk/films/6977-the-wind-rises here. Available in Japanese with English subtitles and American English dub.